The International Mountaineering and Climbing Federation or UIAA recognise eight-thousanders as the 14 mountains that are more than 8,000 metres (26,247 ft) in height above sea level, and are considered to be sufficiently independent from neighbouring peaks. However, there is no precise definition of the criteria used to assess independence and since 2012, the UIAA has been involved in a process to consider whether the list should be expanded to 20 mountains. All eight-thousanders are located in the Himalayan and Karakoram mountain ranges in Asia, and their summits are in the death zone. The first person to summit all 14 eight-thousanders was Italian Reinhold Messner in 1986, who completed the feat without the aid of supplementary oxygen. In 2010, Spaniard Edurne Pasaban became the first woman to summit all 14 eight-thousanders, but with the aid of supplementary oxygen; in 2011 Austrian Gerlinde Kaltenbrunner became the first woman to summit all 14 eight-thousanders without the aid of supplementary oxygen. 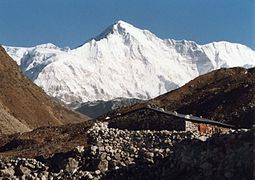 From 1950–1964, all eight-thousanders were summited. As of February 2019[update], K2 remains the only eight-thousander not summited in a Winter ascent. The first recorded attempt on an eight-thousander was when Albert F. Mummery and J. Norman Collie tried to climb Pakistan's Nanga Parbat in 1895. The attempt failed when Mummery and two Gurkhas, Ragobir, and Goman Singh, were killed by an avalanche. The first recorded successful ascent of an eight-thousander was by the French Maurice Herzog and Louis Lachenal, who on the 1950 French Annapurna expedition reached the summit of Annapurna on 3 June 1950. The first winter ascent of an eight-thousander was done by a Polish team led by Andrzej Zawada on Mount Everest. Two climbers Leszek Cichy and Krzysztof Wielicki reached the summit on 17 February 1980. The first person to climb all 14 eight-thousanders was the Italian Reinhold Messner, on 16 October 1986. In 1987, Polish climber Jerzy Kukuczka became the second person to accomplish this feat. Kukuczka is also the man who established the most new routes (9) on the main eight-thousanders. Messner summited each of the 14 peaks without the aid of supplemental oxygen. This feat was not repeated until nine years later by the Swiss Erhard Loretan in 1995. Phurba Tashi of Nepal has completed the most climbs of the eight-thousanders, with 30 ascents between 1998 and 2011. Juanito Oiarzabal has completed the second most, with a total of 25 ascents between 1985 and 2011. The Italian Simone Moro made the most first winter ascents of eight-thousanders (4); Jerzy Kukuczka made four winter ascents as well, but one was a repetition. As of November 2018[update], K2 remains the only eight-thousander that has never been summited in the winter. 30–highest peaks above 500 m in prominence. In 2010, Spanish climber Edurne Pasaban, became the first woman to summit all 14 eight-thousanders with no disputed climbing. In August 2011, Austrian climber Gerlinde Kaltenbrunner became the first woman to climb the 14 eight-thousanders without the use of supplementary oxygen. The first couple and team who summited all 14 eight-thousanders together were the Italians Nives Meroi (second woman without supplementary oxygen), and her husband Romano Benet in 2017. They climbed in alpine style, without the use of supplementary oxygen. As of November 2018[update], the country with the most climbers to have climbed all 14 eight-thousanders is Italy with seven climbers, followed by Spain with six climbers, and South Korea with five climbers. Kazakhstan and Poland have three climbers each that completed the "Crown of the Himalaya". Deaths above base camp on eight-thousanders (1950 to March 2012). In 2012, to relieve capacity pressure, and develop climbing tourism, Nepal lobbied the International Climbing and Mountaineering Federation (or UIAA) to reclassify five summits (two on Lhotse and three on Kanchenjunga), as standalone eight-thousanders, while Pakistan lobbied for a sixth summit (on Broad Peak) In 2012, the UIAA set up a project group to consider the proposals called the AGURA Project. The six proposed summits for reclassification are subsidiary-summits of existing eight-thousanders, but which are also themselves above 8,000 metres and have a prominence above 60 metres. Proposed to the UIAA in 2012 for reclassification as standalone eight-thousanders. List of the subsidiary peaks of the 14 eight-thousanders. 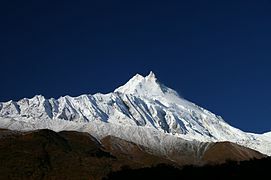 The proposed six new eight-thousander peaks would not meet the wider UIAA criteria of 600 meters of elevation change between standalone peaks, called topographic prominence, as used by the UIAA elsewhere for major mountains (the lowest prominence of the existing list of 14 eight-thousanders is Lothse, at 610 metres). For example, only Broad Peak Central, with a topographic prominence of 181 meters, would even meet the 150–metre prominence threshold to be a British Isles Marilyn. However, the appeal noted the UIAA's 1994 reclassification of Alpine 4,000 metre peaks where a prominence threshold of 30–metres was used, amongst other criteria; the logic being that if 30–metres worked for 4,000 metres summits, then 60–metres should work for 8,000m summits. As of November 2018[update], there has been no conclusion by the UIAA and the proposals appear to have been set aside. 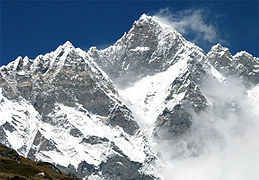 There is no single undisputed source for verified Himalayan ascents, however, Elizabeth Hawley's The Himalayan Database, is considered as an important source for the Nepalese Himalayas. Online ascent databases pay close regard to The Himalayan Database, including the website AdventureStats.com, and the Eberhard Jurgalski List. Various mountaineering journals, including the Alpine Journal and the American Alpine Journal, maintain extensive records and archives but do not always opine on ascents. Reinhold Messner, first to climb all 14 eight-thousanders, and first to do so without supplementary oxygen. The "No O2" column lists people who have climbed all 14 eight-thousanders without supplementary oxygen. List of climbers who have summited all 14 eight-thousanders. Claims in which not enough evidence was provided to verify the ascents of all 14 peaks. The disputed ascent in each claim is shown in parentheses. In most cases, the influential Himalayan chronicler Elizabeth Hawley, is an important source regarding the fact-base of the dispute. Her well-regarded The Himalayan Database is the source for other online Himalayan ascent databases (e.g. AdventureStats.com). Cho Oyu is a recurrent problem peak as it is a small hump circa 30 mins into the summit plateau, and the main proxy - "Did you see Everest" - requires clear weather. Shishapangma is another problem peak because of its dual summits, which despite being close in height, are up to two hours climbing time apart. Elizabeth Hawley famously got Ed Viesturs to re-climb the main summit of Shishapangma. Comparison of the heights of the Eight-thousanders (red triangles) with the Seven Summits and Seven Second Summits. ^ Per The Himalayan Database (HDB) tables, the Climber (or Member) Death Rate is the ratio of deaths above base camp, of all climbers who were hoping to summit and who went above base camp, for 1950 to 2009, and is closer to a true probability of death; the data is only for Nepalese Himalaya. Summary tables from the HDB report for all mountains above 8,000 metres, imply that the death rate for the period 1990 to 2009 (e.g. modern expeditions), is roughly half that of the combined 1950 to 2009 period. ^ As recorded by Eberhard Jurgalski and being any death (climber or other) above Base Camp. ^ This should not be mistaken as being a death rate; it does not imply a probabiltiy of death for a climber attempting to climb an eight-thousander as it includes all deaths from all activities undertaken above base camp (e.g. training or reconissance trips, camp stocking activities by porters who will not be summiting the mountain, rescue attempts etc.). It therefore compares deaths from the larger group of people who were, and were not, making a summit attempt, with the smaller group who were making a summit attempt. While it is not a probability, the statistic does reflect the ratio of people who died above base camp for each climber who summited. 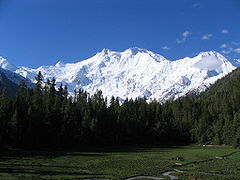 ^ "Fast Facts About Nanga Parbat". climbing.about.com. Retrieved 2015-05-29. ^ Herzog, Maurice (1951). 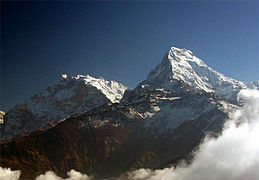 Annapurna: First Conquest of an 8000-meter Peak. Translated from the French by Nea Morin and Janet Adam Smith. New York: E.P Dutton & Co. p. 257. ^ "Lhotse Summits". 8000ers.com. Retrieved 2014-01-04. ^ "Austrian woman claims Himalayas climbing record". BBC News. 23 August 2011. Retrieved 2011-08-24. ^ "Austrian is first woman to scale 14 peaks without oxygen". AsiaOne. 30 August 2011. Retrieved 2014-01-04. ^ "Alpinismo, il record di Meroi-Benet: è italiana la prima coppia su tutti gli Ottomila". 11 May 2017. ^ a b c d Eberhard Jurgalski. "General Info". 8000ers.com. Retrieved 2014-02-21. ^ a b c "DAILY CHART: Stairway to heaven, how deadly are the world's highest mountains?". The Economist. 29 March 2013. For every three thrill-seekers that make it safely up and down Annapurna I, one dies trying, according to data from Eberhard Jurgalski of website 8000ers.com, collected in his forthcoming book "On Top of the World: The New Millennium", co-authored by Richard Sale. ^ "Himalayan Death Tolls". The Washington Post. 24 April 2014. ^ Eberhard Jurgalski. "Fatalities tables". 8000ers.com. Retrieved 23 November 2018. Included are only fatalities from, at or above BC or caused from there. Fatalities on approach or return marches are not listed. 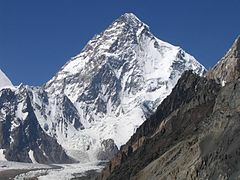 ^ "K2 lies in Pakistan, near the northern border with China". BBC News. ^ Harding, Luke (13 July 2000). "Climbers banned from sacred peak". the Guardian. Retrieved 29 March 2018. ^ Richard Gray (23 August 2013). "The new peaks opened as alternatives to Mount Everest". The Telegraph. Nepal is to tackle overcrowding on the world’s highest mountain by placing greater restrictions on expeditions to the summit of Mount Everest. The move is a response to growing problems with litter, pollution and recent clashes between Sherpas and Western climbers. But in an attempt to appease those hoping to conquer the 29,029 feet tall peak, the Nepalese government is to open access to five other summits that sit over 26,246 feet, or 8,000 meters. ^ a b c Navin Singh Khadka (18 October 2013). "Nepal mountain peak expansion bid stalls". BBC News. The UIAA initiated in 2012 what it calls the ARUGA project with an aim to see if new 8,000m-plus could feasibly achieve international recognition. Under that project, Nepal had tabled five new peaks and Pakistan one. ^ Eberhard Jurgalski. "Subsidiary Peaks". 8000ers.com. Retrieved 23 November 2018. There are several different subsidiary peaks! Here are the geographical facts, from the one "relative independent Main-Peak" (EU category B) over the important subsidiary peaks (C) to the major notable points (D1) Especially the last category is just guessed by contours or from photographs. ^ a b Eberhard Jurgalski. "Dominance". 8000ers.com. Retrieved 23 November 2018. Accordingly, the author introduced altitude classes (AC) and a proportional prominence, which he named orometrical dominance (D). D is calculated easily but fittingly: (P/Alt) x 100. Thus, it indicates the percentage of independence for every elevation, no matter what the altitude, prominence or mountain type it is. From a scientific point of view, altitude could be seen as the thesis, prominence as the antithesis, whereas dominance would be the synthesis. ^ a b "Do we really need more 8000m peaks". Mark Horrell. 23 October 2013. The most prominent one, Broad Peak Central is just 196m high and the least prominent, Lhotse Middle, is a meagre 60m. To put this in context, the highest mountain in Malta is 253m, while the Eiffel Tower stands a whopping 300m. ^ "A funny name for a mountain". Mark Horrell. 4 June 2014. ^ "UIAA Mountain Classification: 4,000ERS OF THE ALPS". UIAA. March 1994. Topographic criterium: for each summit, the level difference between it and the highest adjacent pass or notch should be at least 30 m (calculated as average of the summits at the limit of acceptability). An additional criterium can be the horizontal distance between a summit and the base of another adjacent 4000er. ^ Elizabeth Hawley; Richard Salisbury (2018). "The Himalayan Database, The Expedition Archives of Elizabeth Hawley". The Himalayan Database. ^ a b If a mountaineer wants worldwide recognition that they have reached the summit of some of the most formidable mountains in the world, they will need to get the approval of Elizabeth Hawley. "Elizabeth Hawley, unrivalled Himalayan record keeper". BBC News. 29 August 2010. ^ a b "Elizabeth Hawley, Who Chronicled Everest Treks, Dies at 94". New York Times. 26 January 2018. ^ "High Altitude Mountaineering statistics". AdventureStats.com. 2018. ^ "Climbers who have ascended to the summits of all of the world's 14 mountains over 8000 metres". 8000ers.com (Eberhard Jurgalski). 2018. ^ Eberhard Jurgalski (26 May 2012). "Climbers - First 14". 8000ers.com. Retrieved 2014-02-21. ^ Coley, Mariah. "Koreans Missing on Annapurna Presumed Dead". Alpinist.com. Retrieved 9 November 2011. ^ EverestNews2004.com, News (age calculated: in 2004 Hong-Gil Um was 44). "Mr. Um Hong Gil has bagged his 15th 8000 meter peak". Retrieved 2008-11-30. ^ Kukuxumusu, Spanish News. "Alberto Iñurrategi achieves his fourteenth "eight thousand meters"". Retrieved 2008-11-30. ^ "Best of ExplorersWeb 2005 Awards: Ed Viesturs and Christian Kuntner". Mounteverest.net. Retrieved 2008-11-30. ...the American climber became one of only five men in the world to accomplish the quest entirely without supplementary oxygen. ^ Mounteverest.net. "The wolf is back: Gnaro bags Baruntse". Retrieved 2008-11-30. Last year, Silvio 'Gnaro' Mondinelli broke the haunted 13 when he summited the last peak on his list of 14, 8000ers - becoming only the 6th mountaineer in the world to have bagged them all without supplementary oxygen. ^ "The day after: Silvio Mondinelli, Broad Peak and all 14 8000m summits". PlanetMountain.com. Retrieved 2008-11-30. 13/07 interview with Silvio Mondinelli after the summit of his 14th 8000m peak without supplementary oxygen. ^ "The 14th knight: Ecuadorian Ivan Vallejo is ready to continue". Mounteverest.net. Retrieved 2008-11-30. Implied in text: ...Following Italian Silvio "Gnaro" Mondinelli last year and American Ed Viesturs in 2005, Ivan also became only the seventh mountaineer in the world to have done them all without supplementary oxygen. ^ "The 14th knight: Ecuadorian Ivan Vallejo is ready to continue". Mounteverest.net. Retrieved 2008-11-30. ...Ivan also became only the seventh mountaineer in the world to have done them all without supplementary oxygen. ^ "Denis Urubko, Cho Oyu and all 14 8000m peaks". PlanetMountain.com. Retrieved 2009-05-18. ^ "Ralf Dujmovits". Ralf-dujmovits.de. Retrieved 2010-04-14. ^ "Summit 8000 - Andrew Lock's quest to climb all fourteen of the highest mountains in the world". Andrew-lock.com. Retrieved 2010-04-14. ^ "Australia's Most Accomplished Mountaineer". Andrew Lock. 2 October 2009. Retrieved 2010-04-14. ^ "Piotr Pustelnik summits Annapurna - bags the 14x8000ers!". Explorersweb.com. Retrieved 2014-02-21. ^ "Shisha Pangma: Edurne Pasaban summits - completes the 14x800ers". Explorersweb.com. Retrieved 2014-02-21. 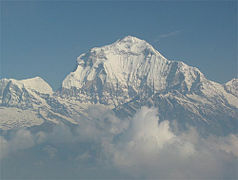 ^ "Abele Blanc summits Annapurna and all 8000ers". Planetmountain.com. Retrieved 2014-02-21. ^ a b c d e f g h i "Climbers - First 14, updated table on 8000ers.com". 8000ers.com. Retrieved 2014-02-21. ^ "Everest - Mount Everest by climbers, news". Mounteverest.net. 18 May 2005. Retrieved 2014-01-21. ^ "Mario Panzeri: sono in cima! E finalmente sono 14 ottomila". Montagna.tv. Retrieved 2014-02-21. ^ a b "日本人初の快挙、8000m峰14座登頂 竹内洋岳". Nikkei.com. Retrieved 2014-02-21. ^ "Climbers - First 14". 8000ers.com. 13 August 2014. Retrieved 2014-08-13. ^ a b "Nives Meroi and Romano Benet summit Annapurna, their 14th 8000er". PlanetMountain.com. Retrieved 2017-05-11. ^ a b "Nives Meroi in Roman Benet preplezala 14 osemtisočakov". Sta.si (in Slovenian). Retrieved 2017-05-11. ^ "Slovenec s 15. osemtisočaka". Delo.si (in Slovenian). Retrieved 2017-05-11. ^ "Pokoril všetky osemtisícovky". skrsi.rtvs.sk. 16 May 2017. Retrieved 2017-05-17. ^ "قیچی‌ساز حماسه ساز شد/کوهنورد تبریزی به هشت هزاری‌ها پیوست". yjc. 19 May 2017. Retrieved 2017-05-19. ^ "Ferran Latorre completa los catorce ochomiles en el Everest" (in Spanish). desnivel.com. 27 May 2017. Retrieved 2017-05-27. ^ "Cadiach, camino del campo 3 tras coronar el Broad Peak" (in Spanish). La Vanguardia. 27 July 2017. Retrieved 2017-07-27. ^ "China's top mountaineer finds the meaning of life at 26,000 feet". Inkstone. 24 August 2018. Retrieved 2018-09-11. ^ I have summitted Cho Oyu 4 times and will be heading for my fifth this coming season. Each time I have watched the Koreans and Japanese go only to where they can see Everest, not the summit, because they know this is what will be asked. "Cho Oyu summit: Where is it exactly". Explorersweb.com. September 2017. ^ Many people who climb Cho Oyu in Tibet stop at a set of prayer flags with views of Everest and believe they’ve reached the top, unaware they still have to walk for 15 minutes across the summit plateau until they can see the Gokyo Lakes in Nepal. "When is a summit not a summit?". Mark Horrell. 12 November 2014. ^ "Asia, Tibet, Cho Oyu and Shisha Pangma Central (West) Summit". American Alpine Journal. 1991. ^ "Keeper of the Mountains: The Elizabeth Hawley Story". Rocky Mountain Books. 5 October 2012. pp. 185–195. ^ Elizabeth Hawley (2014). "Seasonal Stories for the Nepalese Himalaya 1985-2014" (PDF). The Himalayan Database. p. 274. But a South Korean climber, who followed in their footprints on the crusted snow three days later [in 1997] in clearer weather, did not consider that they actually gained the top. While [Sergio] Martini and [Fausto] De Stefani indicated they were perhaps only a few meters below it, Park Young-Seok claimed that their footprints stopped well before the top, perhaps 30 meters below a small fore-summit and 150 vertical meters below the highest summit. Now in 2000 [Sergio] Martini was back again, and this time he definitely summited Lhotse. ^ AdventureStats.net, Official records. "Climbers that have summited 10 to 13 of the 14 Main-8000ers". Retrieved 2008-11-30. ^ Elizabeth Hawley (2014). "Seasonal Stories for the Nepalese Himalaya 1985-2014" (PDF). The Himalayan Database. p. 347. But his claim to have now climbed all 8000ers is open to question. In April 1990 he and others reached the summit plateau of Cho Oyu. It was misty so they could not see well; nine years later Hinkes said he had “wandered around for a while” in the summit area but could see very little and eventually descended to join the others, one of whom said they had not reached the top. ^ "Vladislav Terz". www.russianclimb.com. Retrieved 2016-04-28. ^ "AdventureStats - by Explorersweb". www.adventurestats.com. Retrieved 2016-04-28. ^ Russianclimb.com, Mountaineering World of Russia & CIS. "Vladislav Terzyul, List of ascents". Retrieved 2009-10-06. ^ "Sad results on Makalu and Unanswered Questions: 1 missing climber and 1 passed away on Makalu". 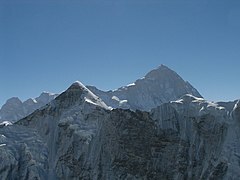 Everestnews2004.com. Archived from the original on 12 May 2012. Retrieved 2014-02-21. ^ "Everest K2 News ExplorersWeb - More dark clouds mounting on Anna summit push; Miss Oh's Kanchen summit "disputed" after renewed accusations". Explorersweb.com. 26 April 2010. Retrieved 2014-01-21. ^ a b "New doubts over Korean Oh Eun-Sun's climbing record, Hawley to investigate". BBC News. 27 August 2010. ^ What would appear to be the most serious blow to Miss Oh, on 26 August this year the Korean Alpine Federation, the nation's largest climbing association, concluded that Miss Oh had not reached the top of Kangchenjunga. "Seasonal Stories for the Nepalese Himalaya 1985-2014" (PDF). Elizabeth Hawley. 2014. p. 394. ^ "Desnivel; Carlos Pauner consigue la cima del Everest". Desnivel.com. Retrieved 2014-01-21. ^ "Carlos Pauner is not sure if they hit the top of the Shisha Pangma (8,027)". lainformacion.com. 18 February 2016.